This is a nicely constructed analemmatic dial, made of concrete, stone and ceramic tile. The hour markers are a series of small posts set in a continuous elliptical path with a 6 meter major axis and 4 meter minor axis. The sundial is located in a field next to a megalithic henge at Keppel Croft Farm and Gardens. A simple steel armillary dial ten feet high overall on a 5x5 foot granite base. The dial is located in front of a building named in honor of William Bunton, a prominent local businessman who died in 1881. A 38 inch diameter porcelain on steel vertical dial declining 14.73? west of east with a point-in-space or nodus gnomon using a 7/8-inch diameter brass ball nodus. Dial face shows Arabic hour numerals, solstice and equinox seasonal lines and a solar noon mark at 1:19:51 PM. Dial shows DST and is corrected for longitude but no EOT correction is provided. It is not know why the street was named Sundial Crescent but, living there, the owners wanted a sundial. On the Sunnyside Estate front entrance is a small horizontal dial on a white pedestal surrounded by a flower garden. The original of this sundial is reputed to be the one that was mounted on the stump of the tree felled by John Galt in his ceremonial founding of Guelph on April 23rd, 1827. The original dial and pedestal were carved from Guelph limestone, and are in very poor condition. They were moved indoors during renovations in 1979. A replica now stands in the original position. See NASS Compendium Vol. 6 No. 3, Sept. 1999. A stone analemmatic dial with engraved seasonal dates and brass hour markers. The dial is located in Lucy Maude Montgomery Garden, built to celebrate the author of the Anne of Green Gable stories and who lived in Norval, now known as Halton Hills. Construction of the dial and garden was supported by the Richard and Jean Ivey Fund of London, Ontario. An analemmatic dial about 25 feet wide with stone markers and metal numbers. At first glance this appears to be a gnomonic dial with a concrete vertical gnomon about 15 feet tall casting its shadow onto a horizontal dial face about 60 feet in diameter in a slightly irregular pattern at one corner of a grass park. But something is seriously wrong for this to be a working sundial. Gnomonic dials tell time by the tip of their gnomon. The size of the gnomon implies that only several hours around noon in the summer could possibly tell time. We would expect that the gnomon is displaced from the center of the hour lines proportional to the height times tangent of the latitude. But here, the brick hour lines radiate centrally from the gnomon. More interesting, the hour lines (and their Roman numeral hour designation) are separated by a nearly uniform increment of 18 degrees per hour. That is, only five hours marks span from North to East. On the outside south wall of the library, about 15 feet above the ground is a vertical dial about one meter square. Dial is declined 18 deg 6 min west. The 1pm and 8pm numbers are missing. The dial is stone with aluminum gnomon and numbers. A horizontal dial approximately 18 inches in diameter. Made of iron with a solid triangular gnomon Cast raised lettering, sun face, sea symbol. Hours marked by raised lines only. 7AM-5PM. On a small white plaque at the north of the dial are the words "Man eats his bread and records the hour; but the mills of the gods grind eternal flour." Very appropriate considering the dial rests on an old millstone. Update: as of Nov 1996 this dial no longer exists. The millstone is still there in front of City Hall, but the sundial and plaques are gone. Wrought iron base, supporting a large millstone on which the dial is mounted. A brass Pilkington-Gibbs heliochronomer aligned to the celestial equator. Rotate the helioscope until the sun shines from the upper hole to the lower plate, then read the time from an accompanying dial. The Pilkington-Gibbs dial includes a patented cam mechanism to adjust for the Equation of Time. 4 ft Steel Sphere. Gnomon frame and dial frame made of 6 in. x 4 ft. steel wagon tires. Gnomon is 6 in. diameter steel rod. Mounted on base using standard pipe fittings. Dial sits atop a 2.5 inch diameter pipe. A small 18 to 24 inch armillary sphere. Has a traditional arrow marking the gnomon. It sits on a pedestal in the center of the herb garden. A bronze 12 inch diameter horizontal dial with hour lines from 4 AM to 8 PM and engraved Roman hour numerals and compass rose. This restoration was donated by Thomas Ritchie who remembered from his youth that the original dial was accidentally destroyed during the construction of the Parliament Library in 1872. The restored dial was unveiled May 19, 1921 by the Governor General, Sir Victor Cavendish, Duke of Devonshire.Dial sits atop light granite pillar approximately 18 inches diameter and 40 inches high. A garden variety round horizontal sundial about 12 inches in diameter. It looks like a bronze casting with iron staining from steel bolts. Hours marks only from VI to VI (6 am to 6 pm). The dial is located in a very shaded spot close to a building and surrounded by trees. Ornamental. Dial plate has inscription "Tempus Omnia Revelat" (Time Reveals All). Two vertical declining dials declining 58.1? west and 31.9? east on adjacent sides of the south corner of the Sisters of Charity of Ottawa Mother House. The western dial is approximately 7x8 feet and the eastern dial is approximately 7x4 feet. The dials are of gray plaster with black painted iron gnomons. The dials decline 58.1? west of south and 31.9? east of south. The western dial has hour lines from 10 AM to 7 PM and the eastern dial has hour lines from 7 AM to 3 PM. 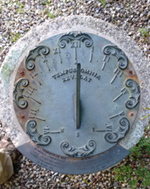 These dials predate the use of time zones and show local solar time. Mayall on p. 229; erroneously described this dial as on Mint Tower. LAMIRANDE, E., Elisabeth Bruyere, Foundress of Sisters of Charity of Ottawa, Ottawa, 1995, p. 207, "In the course of the same winter, Fr. Allard had built a double sundial of great dimension on the southwest angle of the house (corner of Bolton and Sussex streets) which, even today, continues to give the correct time, as it did in Mr. Bruyere's time; she greatly appreciated the convenience. The work presupposed an advanced knowledge of mathematics and astronomy. It was the first of its kind in Canada." A projection calendrical dial that illuminates the headstone of the Unknown Soldier on Remembrance Day, November 11 at 11:00 AM, commemorating the end of World War I. Remembrance Day is celebrated on the 11th hour of the 11th day of the 11th month of each year. The east-west axis extends to the Peace Tower, while the north-south axis parallels the path of the sun across the building on November 11. The concrete walls, grooved with large offset rectangles, are reminiscent of the rows of white grave markers in Allied war cemeteries. The headstone of the Unknown Soldier is the lone artifact, a simple bench the only furniture in Memorial Hall. A large horizontal floral dial approximately 20 feet in diameter. Large circular area on ground forming the dial face with gravel and flower-beds between the hour lines. The flowers are annuals, best seen in the summer blooming season. Update June 2018: The dial has been refurbished with a new, accurately placed gnomon and wonderful bright flowers. A 45 inch diameter bronze equatorial ring dial with an arrow-pointed rod gnomon. The dial is mounted atop a 36 inch square pink granite plinth with chamfered corners sitting on a concrete base. A 46 inch wide by 52 inch high south-facing vertical dial of high density urethane with a 10 mm diameter stainless steel gnomon. Dial face has hour lines with half-hour marks and Roman numerals. Hour lines are longitude corrected. A brass plaque containing the dedication, additional information about reading the dial and an equation of time table is mounted on the building wall below the dial. An informative booklet about church sundials is available in the church. A 42 x 72 inch, 10 inch thick, 3300 pound black granite vertical dial on a 5 foot high steel tube pedestal. Gnomon is a 5/16-inch stainless steel shaft with a dowel-type nodus to mark solar declination. Dial shows EDST with longitude correction. Dial face includes hour and half-hour lines, and equinox and winter and summer declination lines. Dial center is the pivot of the compasses in the Masonic Square and Compass emblem, with oak leaves. Below the dial is a 12 x 72 inch oak plaque inscribed with dedication information and two brass plaques with dial information and EOT graph. A monumental dial in stainless steel. At one end of 'Polaris Boulevard' which includes Terra, a segment of the globe oriented with Sudbury directly at the top. 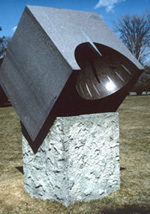 Celeste is a giant (12.8 meter or 42-foot) stainless steel sundial located at the south end of Polaris Boulevard. It consists of two arches, one which represents the equator in the sky, and one which represents the meridian, or the line from the North Pole to South Pole. A large steel pipe makes up the gnomon of the sundial. A very well constructed analemmatic dial about 24 by 11 feet. The dial may be difficult to find, since it is in the center of a field that is devoted to wild grass of the area. Cement markers are used to show the hours and for the central base showing the months where to stand. The hourly markers are corrected for the longitude of Thunder Bay. The site is visited quite frequently by school children and is a great educational tool for dialing. A 210 cm diameter horizontal dial of blue granite with a 56 cm high stainless steel gnomon. In addition to showing local time, the declination line that touches the base of the gnomon traces the path of the shadow on June 23 (date of the 1985 Air India terrorist-bomb air crash) and also marks solar noon at the crash site near Akahista, Ireland where there is a similar memorial sundial. Stones forming the pedestal represent all of the Provinces and territories of Canada, and the countries of India, Ireland, Japan and the United States of America. The face of this equatorial dial is an arc of a sphere 2 meters in diameter. A nodus on the polar gnomon casts a shadow indicating solar declination. Aligned with the dial is a 15 meter meridian line which passes through the site of the transit instrument of the former Toronto Observatory. Approx 55 ft square Stone (concrete?) 4AM-8PM marked in Arabic numerals, half and quarter hours marked with lines. A huge dial. The gnomon is sunk below the outer level by a series of steps. The hours are marked by stone slab 'seats' spaced around the outer square. There are two seats at the noon position to allow for the width of the gnomon. This dial may have been destroyed by now in a rebuilding project. Armillary dial about 4 foot in diameter. Gnomon rod appears to be missing. Raised Roman numbers show the hours from V in the morning to VII at night. Equatorial strip is about 6 inches wide. An equatorial dial with rod gnomon bent into a half analemma. Raised Roman numerals along the equatorial arc from V in morning to VII at night. The gnomon is held by semi-circular arc with pleasing proportions that match the equatorial arc. A striking 30 inch diameter horizontal dial. The equation of time correction is made by a slight rocking of the gnomon about the polar axis, controlled by a manual date index and a hidden cam mechanism. At the south end of the gnomon on the dial is a sunburst design. The octagonal pedestal is ornately covered with six copper plates. Each showing two zodiac signs in relief, forming a frieze 20 inches high around the pedestal. A small bronze 8 inch diameter horizontal dial, sitting upon a granite column of equal diameter. The dial plate has simple radiating hour lines and Roman numerals. No minute or quarter hour marks. The gnomon may have broken off at some time and been repaired, since it is now held on by a rather unsightly bronze angle iron. A 12 foot high noon mark dial consisting of two closely spaced triangular vertical plates, a protruding needle and pairs of summer and winter solstice "wings" that together project a shadow onto the surrounding concrete deck within a 40 foot diameter reflecting pool. When the sun totally illuminates the narrow space between the vertical plates, it is local noon and the shadow cast by the protruding needle points true north. On the summer solstice, the shadow cast by the smaller, upper solstice wings will be at its narrowest width. On the winter solstice, the shadow cast by the lower solstice wings will be at its narrowest width. A simple armillary dial about two feet in diameter with an equatorial hour ring. The dial is mounted atop a tall, black cylindrical pillar within a formal garden of Willistead Manor. The manor is open to the public on selected days. A vertical stone sundial made of white quartzite approximately in a 6 x 4 feet rectangle. 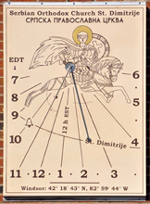 The dial face includes engraved hour lines from 7am to 6pm in Arabic hour numerals for Eastern Daylight Time and an elegant engraved outline of St. Dimitrije based on a partially preserved 14th century fresco of the Saint in St.Mary's Church, Donja Kamenica, Serbia. Rather than summer and winter solstice lines, a single hyperbola indicates the route of the gnomon shadow's tip on 8 November - the day of St.Demetrius (St. Dimitrije). In fact, the gnomon is represented at St. Demetrius' sword (or more appropriately, his spear). A small bell is engraved at 10am indicating the time of morning liturgy. At about 11:15 if you look closely, you can see the subnode point (polos montaza) of the gnomon tip used for alignment during construction. Two vertical bronze-on-masonry dials on adjacent faces upper faces of a square, 25 foot high tower. Dial faces are aligned approximately SE and SW. A bronze armillary sphere is placed atop the tower. 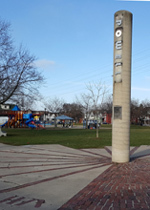 The tower and sundials were designed and built by the Windsor Polish community and dedicated in the Windsor centennial year in memory of M. Kopernik (Copernicus).